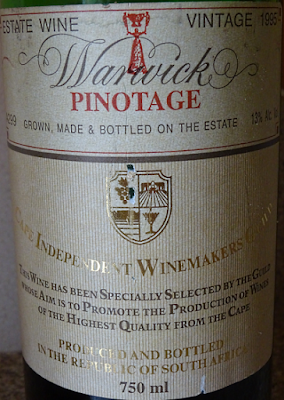 My Wine of the Month for May is Warwick Estate ‘Cape Independent Winemakers Guild’ Pinotage 1995. 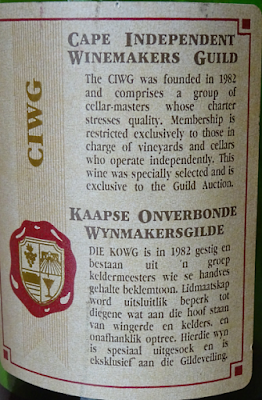 The Cape Winemakers Guild (they dropped the ‘Independent’ part of the name some years ago) annually blind tastes wines submitted by their members. Those selected are sold by auction with an exclusive CWG label. This wine was made by Norma Ratcliffe, co-owner and founder of Warwick Estate, and the Cape's first female winemaker in modern times. When Norma retired from everyday winemaking she was honoured with the title ‘Keeper of the Key’ to continue playing an active role in CWG. This wine was given me by Mike Ratcliffe and I kept in in my Eurocave waiting for an occasion to share with someone who’d appreciate it. That occasion happened when Eleanor Cosman came to stay. Eleanor runs Toronto’s South African Wine Society and her company imports wines into Canada. After an aperitif of Camel Valley ‘Classic Cuve’ 2013 English sparkling wine we opened the Warwick and from the vintage 20 years later Chateau Naudé ‘Vin de Francois’ 2015. 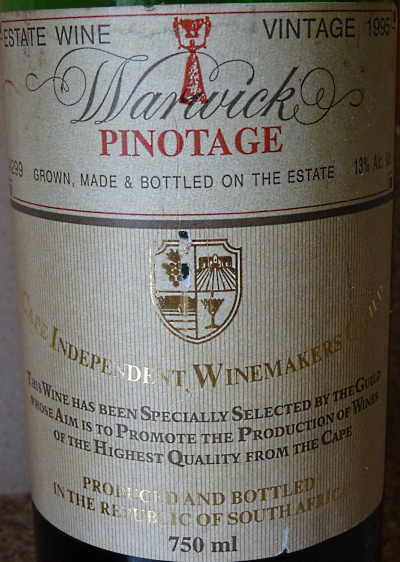 Warwick’s 1995 wine was a pale translucent orange with a berry nose. It has sweetness backed with some thin berry fruit flavours, and a hint of wine gums. There was enough acidity to balance our roasted chicken, but I’d kept it too long for my current fruit loving tastes. A very interesting wine. Thanks Mike!